If the Blackhawks are indeed sincere in their efforts to make the playoffs, Monday night was a game they had to win. At the end of the second period of the Hawks game against the Canucks, the Tampa Bay Lightning clinched the Presidents’ Trophy with a regulation victory over the Arizona Coyotes. That Arizona loss opened the door for the Hawks to inch closer to the eighth spot in the conference. But would the Hawks take advantage? Corey Crawford, coming off one of the best regular season performances of his career, remained strong in the first period. Neither side generated much offensively in the first period, but the Hawks got a late power play. Patrick Kane fired a shot at the net and Jonathan Toews redirected it home for his 31st of the season. The assist gave Kane 100 points on the season, putting him in incredible company in Blackhawks history. The goal game with 35 seconds left in the first period. 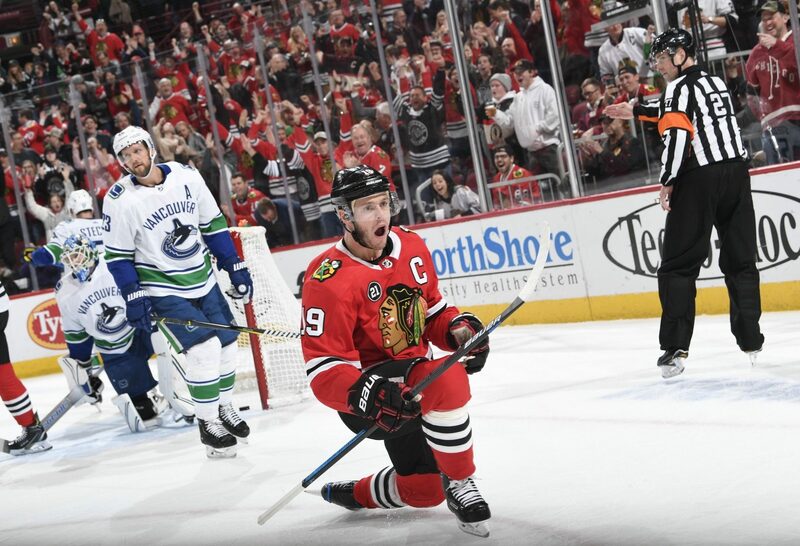 Vancouver out-shot Chicago 11-10 in the first period but the Blackhawks took a 1-0 lead to the room. Dylan Sikura had a strong opening 20 minutes, but couldn’t convert a couple great scoring opportunities. Chicago’s offense never game out for the second period. Marcus Kruger took a terrible penalty 49 seconds into the second and the Canucks converted immediately. Alex Edler’s eighth of the season tied the game at one just 53 seconds into the middle period. Less than six minutes later Markus Granlund gave the Canucks a 2-1 lead. And, the way Chicago skated over the final 13 minutes of the period, a second goal appeared to be enough. In the closing 20 seconds of the period the Hawks entered the offensive zone but opted to pass the puck around for the remainder of a period rather than shoot it. The effort earned boos from the faithful in the seats at the United Center. The Canucks out-shot the Blackhawks 11-4 in the period. Teams that are truly invested in chasing the postseason cannot be limited to four shots in 20 minutes against a bad team. It took nine minutes for the Hawks to generate a solid offensive press in the third period, but the line that got them going was Alex DeBrincat, Dylan Strome and Brendan Perlini. Koekkoek made a nice play to stand up Brock Boeser with six minutes left in regulation. Boeser didn’t appreciate it and held onto Koekkoek’s stick long enough that a penalty could have been called on Tuesday afternoon. Eventually the whistle did come, however, and the Hawks got an important power play. Thatcher Demko made a couple nice saves and the Blackhawks wasted the advantage. Immediately after Boeser left the box the Canucks got an odd-man rush but Crawford made a huge save to keep the game 2-1. Right off a Toews faceoff win with 3:16 left in the third Erik Gustafsson loaded up and let fly. Demko didn’t see it at all with Edler standing right in front of him and the game was suddenly tied at two. Crawford made a couple huge saves late to keep the game tied but the Hawks couldn’t get another shot through. The Hawks out-shot the Canucks 17-11 in the third period. Regulation ended with the Canucks holding a 33-31 shot advantage but important numbers on the scoreboard remained locked at two. It took 16 seconds for Vancouver to win the game in overtime. Bo Horvat took care of the game-winner and the Hawks wasted an opportunity to move up more than one point in the standings. Gustafsson led the Blackhawks with seven shots on net. He led all Chicago skaters with 27:10 on the ice. The only other Hawks defenseman over 18 minutes was Duncan Keith (24:05). Toews skated 21:25 and won 13 of 27 faceoffs. Kane skated 24:08 and had two assists. Both were credited with four shots on net. There some must loses for ARI and wins/or tie for us. That was one of them. Not think we Have to go 8-3 or better. Think ARI needs to lose some games and its right there. 5-0-1 after holding at 4-6 after 7-0 streaking. 23-11-5 since we got ‘this’ yrs team. 2 points was really important. @Mo, the Hawks can’t control what AZ does, relying on another team losing isn’t going to get the Hawks in the playoffs. If the Hawks can’t beat a team they should when the teams in front of them lose, it makes me feel that this team doesn’t have what it takes to make the playoffs this year. The Hawks need to bring it every game from here on out, if they can’t do that they won’t overtake anyone. Sure. I like to look at it as they need to lose or we cant (I know what your saying). Not we have to go 10-1, that doesnt seem realistic. I do think its going to be tuff since DAL and ARI were at 8 and 6. MIN at 4. Just looking at it around 5 or we cant. Were just a little too much behind, since game 30 to do it, without help from ARI and MIN. Those teams havnt been on the move like ARI and CHI last 10 games, was banking on that. Agree with you guys, just looking at it from that angle. I live in Van. and I don’t chime on here often , the harassment will come tomorrow . Whats with this team ? They cant beat this beat up Vancuckoo team . That’s one win in the last 2 seasons . Really , looks like they don’t want it bad enough . This team confuses and frustrates the hell out of me. I thought after The Captain’s goal at the end of the 1st that they’d for sure come out flying…. Then Kruger takes that ridiculously stupid penalty and they’re all out there flopping around like fish out of water. How different would this game have gone if Kruger didn’t go to the box? I hear ya Stefanie – I need to vent too. Very frustrating game and missed opportunity. I didn’t think the effort was poor but the execution was dreadful. They could barely complete a pass, let alone a sequence of passes. Passes a little off the mark and bobbled receptions kept them from clean exits out of the d-zone and crisp puck movement through the neutral zone. And Kane – another game where he looks “off” because he’s bobbling and not controlling the puck like he normally does. Crawford played great for 60 minutes and then lets the OT winner go right through him. Stuff happens but it’s unfortunately CC didn’t stop a relative easy one. I haven’t bothered to check but it seems to me the Hawks have had a hard time beating Philly so this is going to be a very tough game. Skipped this game. Followed via updates on my phone. 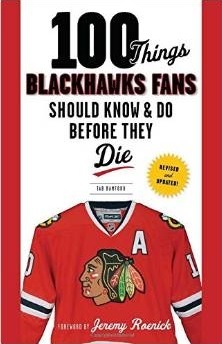 Anyhow…they got a point and Kaner reached a 100 pts again. Cheers to that. Hawks are on a nice run, but when you have no margin for error, any slight slip up is costly. Funny how Bowman and Chayka’s team are fighting for the same exact thing, playoff spot. Frequent trading partners, probably not much longer. JC, time to stop the experiment and renuite 88 19 20! (5v cannot score so Sikura should return to the 3rd line. Pathetic “effort” the first 40 minutes. They didn’t act like they were interested at all until desperation time in the 3rd. How many games have the hawks lost within the first 30 seconds of overtime. Toews, Kane, and Gus looked like their give a damn meter was set on low on the gw goal, particularly the captain. What the hell was he doing? Second period, ridiculously stupid penalty by Kruger behind his own net, and of course Vancouver capitalizes with a flukey goal right off the faceoff. On Vancouver’s second goal, Kunitz let’s his guy get in front of him and makes no attempt to stop him. Can’t wait for these two useless bums to be gone. Far too often when the Hawks play a team on the second of a back to back, they themselves look like the tired team. Don’t deserve to make the playoffs dropping games like this and to the Kings a couple of weeks ago. Thank Crow for the point, but this team has been thoroughly outplayed in 6 of the last 7 periods they’ve played. I have to agree about overtime and their effort–but 3 on 3 is a gimmick. Even teams that are on edge, and every point counts-have periods where they are off, like in the second yesterday-many weird games these days. The contest push must be exhausting after a long year and even if you get in-what will you have left against a team that is really good? Teams like Vegas, Tampa are playing on a different level here at the end. Chicago is 31 st overall defense since Jan. 1st (and 31st in the PK)-they are playing on fumes and can’t defend in a meaningful way. What does this all mean other than giving the young guys a taste of the payoffs? They need to improve. Craig, like you said were doing really good going 23-11-6 since we did the roster adjustments/game 30 and 5-0-1 run were on now but any one period/game stands out more when you need to win every game/think you have to go 10-1, which was 15-1 before we won the last 5. Its just going to happen with weird games these yrs, every now and then. You cant have a legit fair chance to play to make playoffs being 9 game under .500 30 games in and we almost did it. Noonan, need to improve, have a deep roster, and not use a lot of energy like we did the last 2.5 mths because we were 9 under at game 30. A measly .500 record at game, has us at 12 games over .500 right now and tied with VEG for 5 seed. The next 4 games is/are the season. A win versus Philly to show you can bounce back from a let down. Wins against teams in front of you are a must. Minimum you can come out of the last 10 games is 10 points without ties with Az and Col. 12 to 14 should get us in. Wrap, we have gone on a run like that in 17 of last 23 games. Its happens every yr like BOS did. What BOS didnt do was the last 10/15/or 17 games of season. Its usually always somewhere in there but not to the end/82 game. Its extremely hard to run it to game 82 as appose to win or tie 12 games in a row, like games 65-77. This is good learning for the younger/inexperienced players and we will need to learn more like this in a yr from now, So were ready for it in a yr/2yrs. The season has broken a lot more positively than I expected, and in many ways we are again fun to watch. That said, one thing I had hoped for is that we would become a harder team to play against. It hasn’t happened — the sandpaper isn’t there. Even though they aren’t good right now, Canucks always play hard and to me that was the biggest difference in last night’s game. The other thing was the puck handling — ours was brutal. I don’t know how a whole team comes down with stone hands at the same time but it’s hard to get any flow going when you’re forever trying to settle the puck. To all the people saying Kane looks disinterested, well you would too if your linemates were Anisimov and Kahugn. Kane is a world class player but he needs to play with at least one finisher. When you have dynamite don’t turn it into a firecracker!! Just my rant for the day. Well said EARL. If JC wants to make one last run, Kane needs to play with Toews and Saad. Anisimov and Kahun will not get Kane any opportunities down the stretch. Since this switch, 88 has slowed down. Sikura remains a bottom 6 player, at best. At the end, Hawks are short on scoring depth with players like Kahun, Sikura, Anisimov, Kunitz, Kruger , Kampf and Hayden. Happy Perlini is improving every game. Crawford deserves lots of credit to jump right into this chase even though it will be extremely hard for the Hawks to get into the playoffs. Jordy, a side of what your saying is this. We had to play like VAN and other do/play hard that way, during the first 30 games because we had to play that way to win or we wouldnt win more then half of the games. Since game 30ish, we made the roster adjustments, and the team is Way better since then/Maine;y because of those adjustments. So we are a better team that can win without having to muck it up the whole game and play hard just to win. We can win with skill and actually had a PP. I know what your saying and we need to do what your saying. Maybe because we go a lot better, with new roster/adjustments, the guys wanted to play with skill and not this tackle and go fast style-because of not having as good of a team. I think same we need those kind of players to add to what we have and some other positions as well need upgrade/really just quality depth will do it. Jordy, thats why I was saying, after we had out first good stretch, the 6-2-1 right after we lost 8. We then lost 5 (half were ties) during that span I was saying we need a couple more guys like Shawzer to fill out roster so we have Balance. Totally did better this yr, then we though before it started. This is still a transition yr, but the guys wanted to play and did right out of the gate 6-2-2 (thats with tank ufas)(but that way couldnt last) then 3-16. It was the roster adjustments that got us our team this yr. Which is 23-11-6 since the roster was revamped. For making the playoffs were 16-6-1 starting with the streaking, what more could you ask for. Just too far behind, and still we are this close. We know the Calvary is coming with the good young draft players. Theres a bunch of blue chip players coming that are going to be really good. Everyone doesnt make it but these guys are different. We added, with the roster adjustments-game 30ish, the players during this season that kick started the team roster wise. Now we just need to continue with another very good draft and add add add add july 1 what we need. No more tank ufas please. The transitions yrs (2) are over! Kane is like a finely tuned race car that has gotten a little out of tune lately. There may be a physical reason for it but I suspect it may be because he’s lost the motivation that drives him to be one of the best hockey players in the world. I don’t believe for a moment that Kane is a selfish player or that he puts his own success above the success of the team – but – I do believe that the challenge of achieving personal success drives his RPMs up to the red line, to continue the race car metaphor. In other words, when he was chasing Kucherov for the scoring title he kept his engine rev’ing high and he got maximum horsepower and that translated to almost otherworldly results on the ice. But then he had a couple games where he got only a point or was held off the scoresheet while at the same time Kucherov was scoring 3 and 4 points and pulled out of reach. I believe that took the edge off a bit and he isn’t able to run at a sustained 4500 RPM any more. It’s a human nature let down thing. It’s not that Kane doesn’t want the team to win but he doesn’t have the same horsepower to expend right now. Agree with Earl about Kane-line, some fatigue etc. But you can’t look at the 2 month run as his normal-that was above elite and now anything looks pedestrian and he will still get points. He’s got genius. Any news on when Caggulia is coming back? I’m sure it’s a meaningless thing to look at on my part, but seems like Kane was scoring like bonkers when Caggulia was banging bodies and creating chances for him. Like others I didn’t really get Sikura playing on the top line. Yeah, he’s playing better and eventually needs experience, but this team needs to score! If they are totally out of it, yeah, play him there maybe. But not last night. Thought Saad played harder throughout the game than some other guys did. Seemed like he outskated his mates and was having to fight through multiple defenders. Didn’t get rewarded for his efforts. Also didn’t get Foley saying right off the bat that Vancouver was totally out of the playoff picture. They are a long shot like the Blackhawks but they are not out of it. And they played better than the Blackhawks head to head. I’m venting a bit, too. They needed both points last night. Wrap – good point on Toews with Kane. That PP goal last night is indicative of their chemistry. Trip, there was a report yesterday that he wasnt skating/ready yet, just working out. Helping, no no I ok.
ER, thats a good example/logic. The lines also messed thing up a bit, 64 and 91. Kaner was tearing it up before the lines were that, but when 64 and 91 got hurt it messed up the whole team for a 5 or so stint. Besides what your talking about, both happened. Cagguila not skating yet according to Colliton, still in concussion protocol. That’s a shame he really was a spark plug and a great find. Unrelated topic : Columbus brass must be crapping themselves. 5 draft picks, 3 prospects and a conditional 1st round pick for Duchene, Dzingel and McQuaid and they are dangerously close to missing the playoffs. Jordy I always would want at least 3 sandpaper players to be on the bench for a game. Depending on the team you’re playing maybe only 2 are needed or 4 are needed. This is excluding d men. Should have two of those. Murphy and KoKo fit that. Sandpaper that is known to have or had have a scoring touch. LA Edm Ana Ott need to blow things up. I say we help them by picking up half of Brown’s Kassain’s and or Ryan’s salary. For future sandpaper to grow with our young guys how about we tender Lemieux a 4yr 12mil sheet. Kahun’s moves aren’t as crisp lately and his passing is way off. He’s not buying space and time like earlier in the year. His decision making is still very good, so I wonder if he’s running out of gas. I still like him and think he’s part of the depth problem we have moving forward, but no denying he’s had several sub-par games lately. Might consider scratching him against Philly. Let him rest and send a message. Powers has a nice write up on Sikura today in TheAthletic. I like those lines. If anyone can help Sikura get that 1st one – it’s Kane. Sikura is a better fit to play opposite wing from Kane than Saad because he can play play a better east/west game than Saad. I think Kahun would also work well with Toews-Kane but at this point I’m happy it’s Sikura because I think once he gets that 1st goal he will settle in and could end up being a key piece to the team in the coming years. Rutta went to Tampa when we traded him there for Koekkoek. Those lines make the most sense. What a test/challenge for this young inexperienced group to have, to make playoffs after being 9 games Under .500 at game 30 and needing to go something like 12-3-1 in last 16 games, 5-0-1 six games into that. ER, wouldnt that be something for 11 and 95 to turn out to be good players, when for however long they didnt look good and people/lots of wanted to trade/waive.